2016 has been a year filled to the brim! There has been travelling and stitching days, classes and lots of new patterns… with dimensional daisies, gingerbread men and roses, vintage stitchery, swinging elves, a jewellery keep, needlework roll and more. I’ve been so encouraged by you through the year… and I’m so thankful for that. I’ve enjoyed meeting many of you in person at different events and it’s been so nice to be able to share techniques and stories, while getting to know you just a little. Online connections have become face to face friendships, which is wonderful for a reclusive homebody like myself. 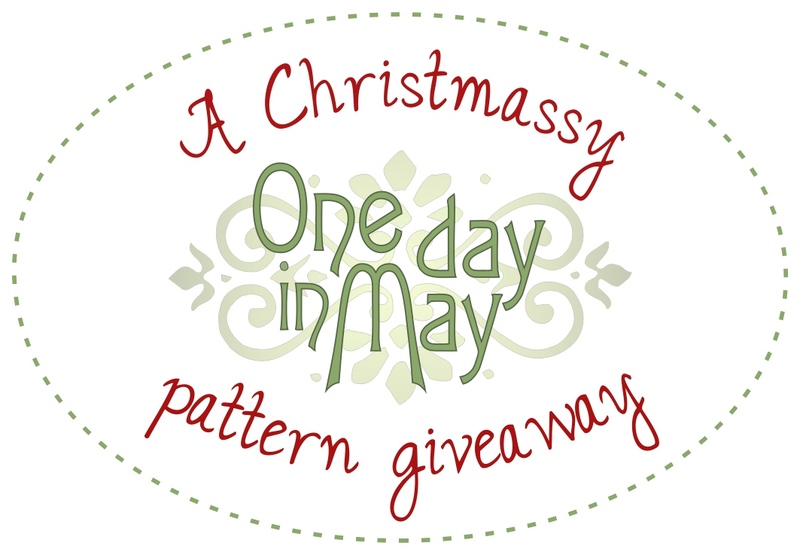 10 readers will win a One Day in May pattern of their choice (excluding block of the month patterns). Simply take a browse through the “my patterns” page, select which pattern you’d like and leave me a comment telling me which one. I can’t guarantee that winners will receive their pattern before Christmas, but it will be mailed this week. Comments are open until 10:30pm AEST December 21st. Winners will be drawn and emailed December 22nd. Thank you again for reading, following and encouraging through 2016. Wishing you luck… I hope you win! Wow… I love all of your patterns… I love Christmas patterns… and gingerbread men so it has to be the Sweet Treats – Christmas fabric bowl. LOVE it just so cute. The new table runner reminds me of the peace of christmas lolxxx regards Glenda. Loving the Daisy Dance Needle Keep, an original style and design. I have a couple of your other patterns and they are easy to follow and finish. Truly beautiful embroidery, it would be a delight to work. Hello and Merry Christmas! The vintage stitchery is so gorgeous! I noticed it in my feed recently and promptly investigated your website! 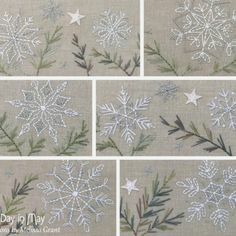 I have a lovely vision of a restful holidays with calming embroidery, which could perhaps be finished by next December, in front of Netflix! Bliss! I would love to win Joyful Angels please. I love the Petite Blooms Nedlebook and Roll very cute. Have several but Petite blooms needle book I don’t have and would like. Absolutely love the sweet treats pattern could fill to the brim with Xmas goodies!! All your patterns are wonderful. I like the daisy dance as looks so lovely and fresh. I need a new needle keep as my current one is alittle frazzled. Melissa, I would be just be tickled to stitch up “with needle in hand”. Thank you for your very generous offer. Wishing you and your family a very blessed holiday. I enjoyed looking at your patterns and they are beautiful. I have not discovered you until now so glad I have! I love the needle keeps designs. 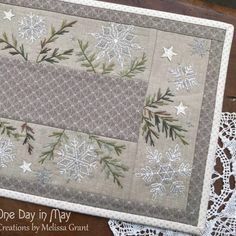 Melissa, I love the look of the Festive Star embroidered doily. I think it would challenge me to learn new techniques. So generous of you to offer this give-away…… thanks. Hi Melissa ! I love very much your work ! I would be delighted if I can win “Petite Bloom”pattern ! It is so cute ! Have a wonderful Christmas with all your family ! Merry Christmas Melissa. If I was lucky enough to win, I would love your Sew Tidy – Tools and Notions Keep. Thank you for the lovely giveaway. Goodness what a difficult thing to do. I absolutely adore all your patterns – the decision finally came down to one of your newer patterns. ‘ Petite Blooms needle book and needle roll’ is my pattern of choice thank you. If I had the opportunity to choose it would be anyone with the Red Robin on it. He is a gorgeous bird. I would love to win the petite blooms needlebook and roll. I love all your patterns but I just can’t go past the redwork Christmas wreath it’s just stunning…thanks for the chance to win it 😊Barb. I love ” Good Tidings, Vintage Christmas Stitchery”. All of a sudden I have the urge to sit in a quiet corner and stitch. This one would be just perfect. I love all your patterns, but if I had to choose one to win it would be the “Good Tidings” stitchery. I belong to a couple of choirs and we spend a lot of December singing around the area. I can really relate to these children. I love all your patterns and have bought your roses pincushion and daisy needlework keeper. My next project I would love is Hannahs garden. I love all your patterns. But Atm I love Hannah’s Garden or Heart. I love the colour combination. Red Robin pouch and Jewelry Keep. Love your patterns and already have a few. I love all of your patterns and I have a few of them. I love red robins. I would love to stitch your red robin pouch. Thank you. “With thread in hand” because that’s what I love to do.Merry Christmas to you and your family. I love Daisy Dance as dragonflys remind me of my dear dad who was my biggest supporter in life, miss him every day. The patterns are all beautiful, bit hard to decide 🙂 but I think ” redwork wreath ” or ” sew with thread” . Thanks for chance to win a beautiful pattern good luck to everyone 😊😊😊 merry Christmas . Thankyou for the offer of a free pattern. If I was to win, I would love to have the Trio of Patterns please. Although Id be happy with anything on offer. I am over the moon with those I have recently ordered and received. To those who win a pattern, Congratulations and happy stitching. I do hope winners will put a photo on this site, to share with us all. Merry Christmas to all, be safe but have fun with those you love most. I just love the Redwork Christmas Wreath, it is just lovely. Very hard to choose one but I love Hanna’s Garden. Merry Christmas to you. I would love “Sandy Swinging Elves” I fell in love with these little fellows as soon as I saw them. They are adorable. I just love the Christmas bowl! Love to make for Nieces and nephews and maybe Grandies sooon! I think this dove is beautiful and so unique. You are very talented. Beautiful. I already bought your Fields organiser when I attended one of your classes, Melissa. I would also love to sew your red Christmas wreath. Wishing you a wonderful Christmas. All your patterns are gorgeous, and thanks to your Facebook post, I am just learning about them. Any of them would be awesome to win, but I think my favorite is the Bowl with the Christmas bowl with the gingerbread men. I can see that being a gorgeous gift next year. Thanks for your giveaway! Merry Christmas! and Blessings for the New Year! I love your website and I think my favorite patterns are everything!! But having to pick just one, I’ve narrowed it down to two………I love ❤️ either the Let there be joy table mat or the Red work Wreath! Either of them would be AWESOME!!!!! Thank you for the opportunity ! Son hermosos todos.Lo dejo a su eleccion,es muy dificil elegir uno. Your patterns are a delight and I always enjoy seeing what you come up with next. If I were lucky enough to win I’d have to pick your new table runner ‘Let there be Joy’. I’m a sucker for designs with sweet little birds and this design stole my heart. Thank you for the opportunity to enter. I am new to your designs but love them! I ordered several after I saw your first posting. My kitchen is done in gingerbread men so I would love to add the gingerbread man bowl to my collection! Thank you so much! All your patterns are beautiful but my favourite is Daisy Dance needle keep! i love your Red Robin Pouch and the Red Robin Jewellery keep. Love all of your designs. Thank you for the opportunity for us to win one of your lovely patterns!! What a very generous idea and fabulous timing with a few quite days after Christmas rush. I would love to receive the Daisy Dance Needle keeper if you choose me, Thanks you . Have a wonderful happy stitching Christmas. I love the Dancing Daisy needle work keeper…. The colors you use are so soft and dreamy… who wouldn’t want one!! I would like to take Joyful Angels on Holidays with me. What a generous giveaway. I love the Christmas bowl with the gorgeous gingerbread men. Mind you, any of your patterns would be lovely. Sweet treats- christmas fabric box. I would use this for the children at my childcare centre every year for their special treats we bake. The Petite Blooms Needlebook & needlework Roll would be such a treasured addition for storage of handwork projects. Such a gorgeous giveaway, Merry Christmas, happy stitching. I really like the Sweet Treat- Christmas Fabric Bowl. I love Petite Blooms and Daisy Dance, can’t decide. Thank you for the giveaway. Merry Christmas! Thanks for the giveaway, I would love the Daisy Dance Needlework Keep. I would really like the red work christmas wreath. I am a mad stitcher of red and blue work. Even winning prizers at our local agricultural show. Stitcheries are my passion. I have several of your patterns and would love Daisy Dance. Merry Christmas. I have fallen in love with your new pattern Red Robin pouch & jewellery keep and would love to win it as I do lots of travelling. Red Robin Pouch and Jewellery kit. so in love with this! 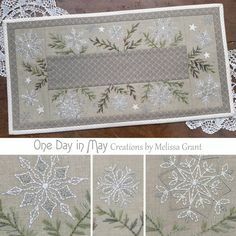 Hi Melissa, love all your patterns, but I would choose Let There Be Joy, table runner so sweet & pretty. Thanks for letting us choose. I did a lovely workshop with you in Port Pirie when you were pregnant, it’s a while ago. I love the robin pouch and jewellery keeper, it is very cute. I finished your projects and gave them away as treasured gifts to friends. I so love your design & if I was lucky enough to be chosen I would love “With Needle & Thread”. All your designs are beautiful, so really, any would be wonderful! Thank you for giving us this opportunity. I just love the Red Robin Pouch and Jewellery Keep but the Daisy Dance Needlework Keep is an absolute close second. I do have the Waterlily Dreaming Needle Keep pattern and treasure it. Just love your work. It is timeless. Love all your patterns & have a lot of them but I would really like Red Robin Pouch. ‘Let there be Joy’ is the perfect gift for a friend in need. I have a lot of your patterns already, they are just so beautiful. My pick would be the lily pilly table runner. I would love to make this. Wishing you a very Merry Christmas and look forward to seeing what you have in store for us in 2017. Love the Red Robin pouch,being English this certainly means Christmas to me! Deck The Halls The pattern is so unique I love it. You provide a varied and diverse range, I always look forward to the next new project popping up in the shop. how the flowers are dimensional, they make great gift for all girlfriends. Merry Christmas Melissa and thank you for this wonderful opportunity to be in a chance to win one of your beautiful patterns, I would love to be considered for the “Let there be Joy” Christmas Table Runner. So many lovely patterns and to choose one is difficult but I think the “petite blooms” would be the one for me. Your patterns are gorgeous but my favorite is the sweet treats Christmas bowl. Thank you! Hi Melissa. All your patterns are gorgeous. I would love the chance to win “Joyful Angels” so thank you for the opportunity. Merry Christmas. Love all your designs and have completed a few. I love the look of your Lilly Pilly table runner and would certainly enjoy the challenge of making it. Merry Xmas and happy sewing in 2017. I love so many of your patterns, and I already have quite a few! So if I was lucky enough to be chosen a winner, I would really love the Lilly Pilly Table Runner pattern..it is just beautiful (like all your patterns). Thank you for the chance to win! Let love grow here [did I get the words right] that is a beautiful piece. Thank you for the opportunity to enter and good luck to the winner. Thank you for the opportunity to participate in your Christmas give-away. I would love “With Thread in Hand” as this would look fantastic in my new sewing room. All your patterns are lovely!! My pick would be the Sew tidy tools and notions keep, thankyou!! Truly beautiful designs. They would be a delight to work. Love Hannah’s Garden. Petite Blooms needlebook and needlework roll just call my name. So love your work. Hi. Love all of your designs. Recently madeDaisy Dance for a friend for Christmas which she loved. I would like the Red Robin pouch and jewellery keep please. Have a merry Christmas and a happy and safe new year. My favourite pattern at the moment is Petite Blooms. I love, love all your patterns, they are so exquisite, and beautifully designed. I really would like to make Petite Blooms, so pretty. Thank you for a chance to win one of you patterns. 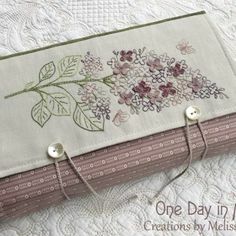 I love the petite blooms needlebook & needlework roll Melissa-it is just so pretty & the colours are gorgeous. Thank you for such beautiful designs. oh wow, how to pick just one pattern…. mmm very pretty patterns – I think I will go with ‘Christmas bowl’ ..thanks for the opportunity to win a pattern and merry Christmas..